Most electric motors are designed to run at 50% to 100% of rated load. Maximum efficiency is usually near 75% of rated load. Thus, a 10-horsepower (hp) motor has an acceptable load range of 5 to 10 hp; peak efficiency is at 7.5 hp. A motor’s efficiency tends to decrease dramatically below about 50% load. 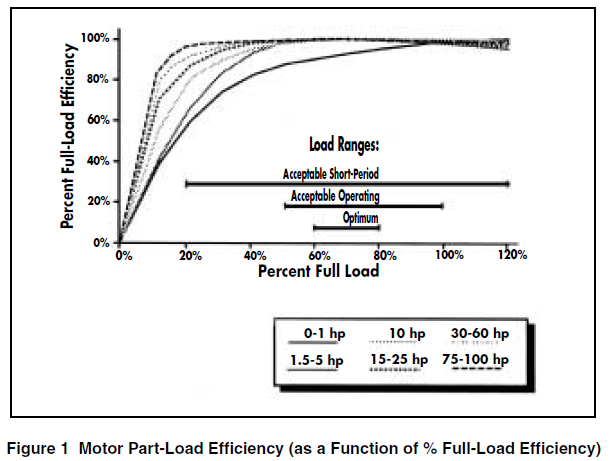 However, the range of good efficiency varies with individual motors and tends to extend over a broader range for larger motors, as shown in Figure 1. A motor is considered underloaded when it is in the range where efficiency drops significantly with decreasing load. 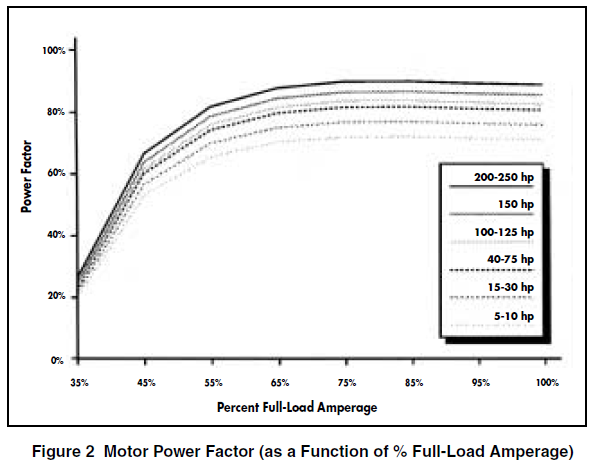 Figure 2 shows that power factor tends to drop off sooner, but less steeply than efficiency, as load decreases. Overloaded motors can overheat and lose efficiency. Many motors are designed with a service factor that allows occasional overloading. Service factor is a multiplier that indicates how much a motor can be overloaded under ideal ambient conditions. For example, a 10-hp motor with a 1.15 service factor can handle an 11.5-hp load for short periods of time without incurring significant damage. Although many motors have service factors of 1.15, running the motor continuously above rated load reduces efficiency and motor life. Never operate overloaded when voltage is below nominal or when cooling is impaired by altitude, high ambient temperature, or dirty motor surfaces. If your operation uses equipment with motors that operate for extended periods under 50% load, consider making modifications. Sometimes motors are oversized because they must accommodate peak conditions, such as when a pumping system must satisfy occasionally high demands. Options available to meet variable loads include two-speed motors, adjustable speed drives, and load management strategies that maintain loads within an acceptable range. Determining if your motors are properly loaded enables you to make informed decisions about when to replace motors and which replacements to choose. Measuring motor loads is relatively quick and easy when you use the techniques discussed in this fact sheet. You should perform a motor load and efficiency analysis on all of your major working motors as part of your preventative maintenance and energy conservation program. Use Attachment A, “Motor Nameplate and Field Test Data Form,” to record motor nameplate data and field measurements. Motors that are significantly oversized and underloaded—replace with more efficient, properly sized models at the next opportunity, such as scheduled plant downtime. Motors that are moderately oversized and underloaded—replace with more efficient, properly sized models when they fail. Motors that are properly sized but standard efficiency—replace most of these with energy-efficient models when they fail. The cost effectiveness of an energy-efficient motor purchase depends on the number of hours the motor is used, the price of electricity, and the price premium of buying an energy-efficient motor. Use Attachment B, the “Motor Energy Savings Calculation Form,” to determine the cost effectiveness of motor changeout options.